Freedom has a price and for Marissa Alexander that price is $11,000. And her "freedom" was two years of house arrest. Although Alexander defended her actions with Florida's Stand Your Ground Law, the law famously used by George Zimmerman's defense after the death of Trayvon Martin, the judge ruled the law was not applicable in her situation. Instead, she pleaded guilty to three accounts of aggravated with a weapon. So why was Alexander unable to use the same defense as Zimmerman? She after all, didn't kill anyone and was definitely being threatened. Well, according to the judge "she could have just left her house instead". This says a lot about how we treat female survivors of domestic violence. This is not the first time survivors of domestic violence have been criminalized in the justice system. In 2006, Titches Lindley was murdered by is step-father, Alonzo Turner. His mother, Arlena Lindley, had faced multiple violent approaches by Turner famously documented in this BuzzFeed investigative article. By the end of the case, Lindley was sentenced to 45 years of prison for child abuse by "omission". When investigating the laws surrounding the charge, sometimes known as "Failure to Protect", many do not consider domestic violence under special considerations when prosecuting mothers. 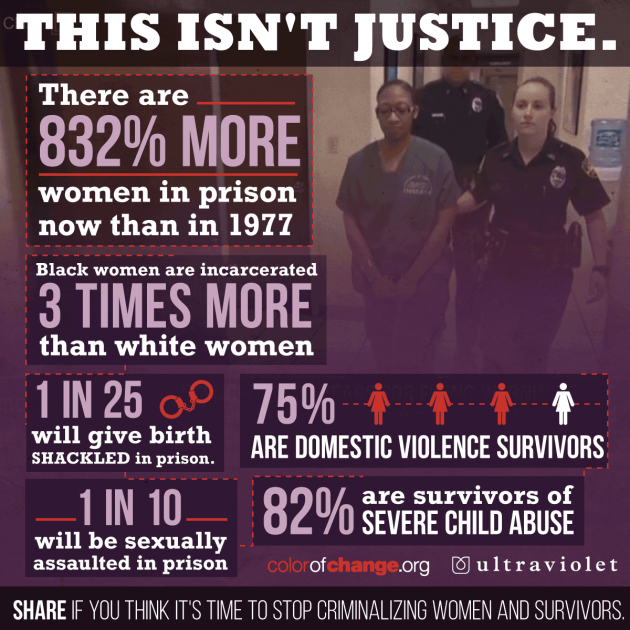 Perhaps, when 75% incarcerated women are domestic violence survivors, it is time that we reconsider portions of laws and try to better coordinate our efforts towards justice.